From the nation's top cooking school, an indispensable resource for home cooks who love to entertain. The Culinary Institute of America is the world's premier culinary college - a place that offers rigorous, professional-level instruction for aspiring chefs who want to perfect their cooking and baking skills. Taught by talented chef-instructors, courses at the CIA provide an in-depth understanding of ingredients, techniques, and recipes, giving students the confidence and know-how they need to unleash their culinary creativity. 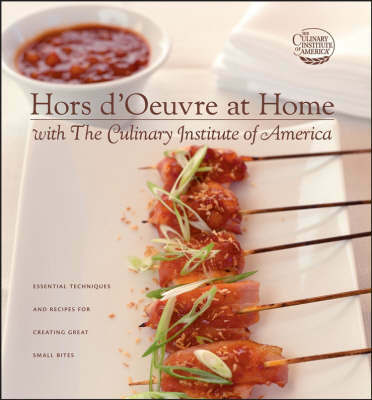 Hors d'Oeuvre at Home with The Culinary Institute of America applies the CIA's thorough, comprehensive approach to hors d'oeuvre, giving you all the information, inspiration, and recipes you need to prepare a dazzling array of bite-sized treats for any occasion. The book divides hors d'oeuvre into seven basic types - bite-sized containers; fillings, dips, and toppings; filled, stuffed, layered, and rolled; skewered and dipped; bowls and platters; cheese service; and bite-sized desserts - and provides detailed guidance and recipes for each. From Goat's Milk Cheese and Sweet Onion Crostini, Chicken Saté with Peanut Sauce, and Mediterranean Seafood Terrine to Small Seared Lobster and Vegetable Quesadillas, Mozzarella Roulade with Prosciutto, and Miniature Chocolate Éclairs, there are more than 150 recipes for a broad range of stylish hors d'oeuvre, along with background information, serving suggestions, ideas for recipe variations, and advice on selecting high-quality store-bought items. Throughout, 40 vibrant full-color photos illustrate techniques and capture the appeal of finished dishes. With the professional-caliber guidance and recipes in this book, you can prepare an enticing assemblage of hors d'oeuvre that will rival that of any caterer - and impress your guests.